Webcam San Salvador: Several Views - Several views of San Salvador, capital city of El Salvador. El Cuco: Playa Las Flores, 81.9 mi. Villa Nueva: Weather in Villa Nueva, 108.3 mi. Antigua Guatemala: Weather in Antigua Guatemala - Antigua Skycam, 117.8 mi. Managua: Weather in Managua - Managua Weather Station, 223.7 mi. West End (Roatán): Seaview, 249.9 mi. West End (Roatán): Roatan Divers, 249.9 mi. Carnival Miracle: View from the Bridge, 262.1 mi. Carnival Dream: View from the Bridge, 272.7 mi. 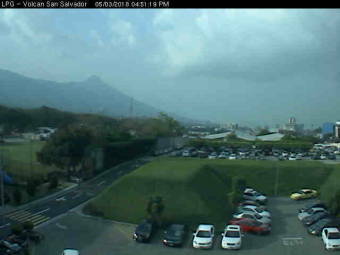 This webcam San Salvador with the theme City Views was added on May 29, 2008 and is operated by La Prensa Grafica. It got 15535 visitors since then. Shouldn't this webcam work or should the link be wrong please report that here. You can add this webcam here to myCams.